Do you have items hanging in your closet that you can only wear with that one thing, that one way? I do too. Usually when purchasing items to add to my wardrobe, I try to choose versatile pieces that can be worn all kinds of different ways. I also like to step into my closet and create outfits built around one item. It’s like a game! How many outfits can I create with this shirt, I ask myself. 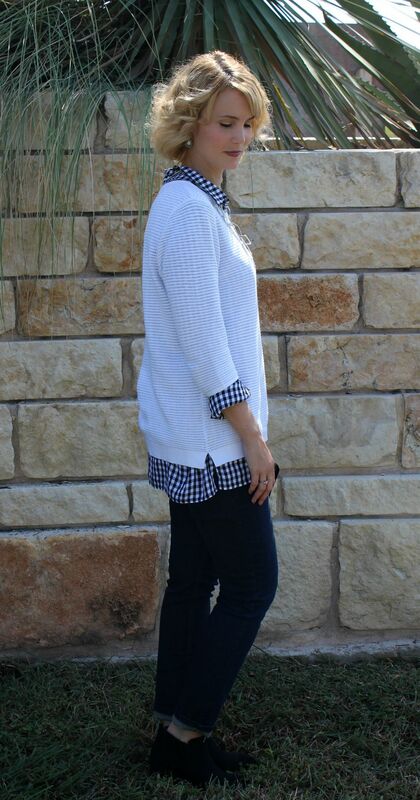 So when this long sleeve gingham shirt from J. Jill arrived on my doorstep, I knew I had a shirt for fall I was going to not only love, but be able to wear over and over again – in several different ways. To me, it’s all about getting the most out of the clothes in my closet. Along with my gingham shirt from J. Jill, came a white lightweight pullover and jeans. I’ve featured J. Jill denim once before and mentioned how great they fit. This pair did not disappoint and I have worn them over and over again. I love how the gingham shirt looks under the pullover and it’ll give me an extra layer if our temperatures ever cool down. The pullover is also super cute with just a tank underneath. 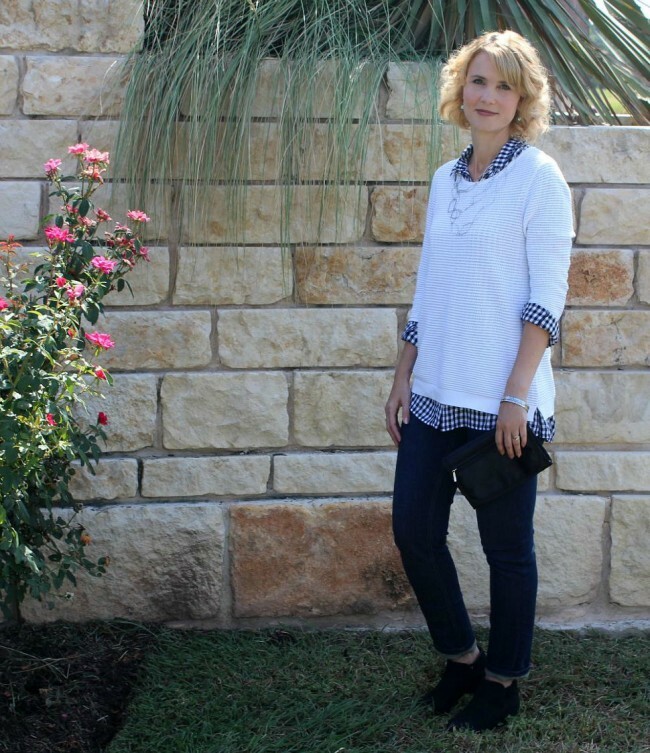 I love an all black outfit, but I usually like to break it up with something – whether it’s a pop of color from jewelry or an awesome shirt like the gingham one. 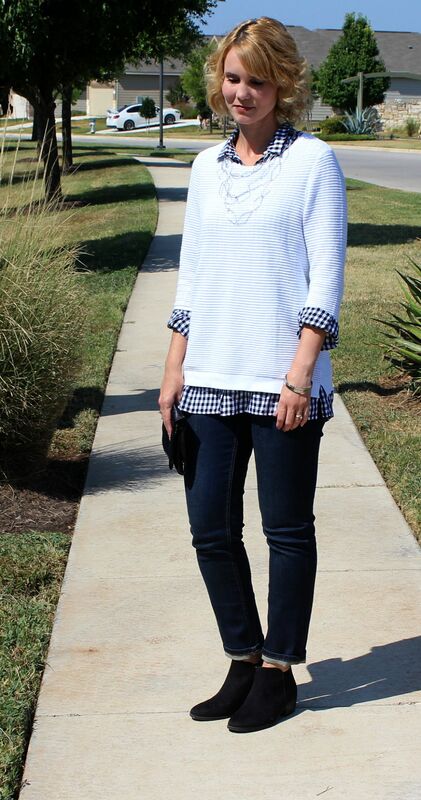 This outfit is a simple tank, pair of denim, my favorite black sneakers, gingham shirt and a gold chunky necklace. 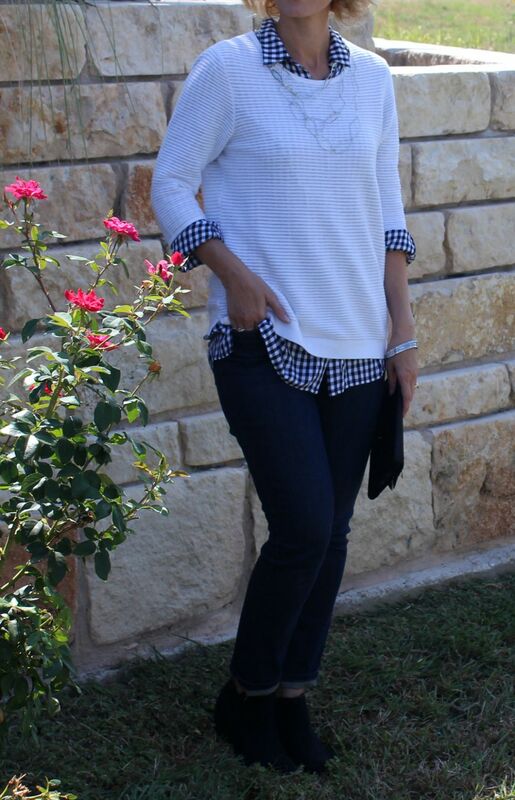 The gingham shirt is perfect worn open and makes for a fun casual outfit. Although the gingham shirt is fairly long, it’s lightweight enough to tuck well into a skirt. And with fall coming, I’ll be very ready to start wearing tights and L’eggs hose again. If I want some color on my legs, but I don’t want the heaviness of tights, hose are the way to go. Top it off with my favorite pair of ankle boots and I have an outfit I love. There you have it! One gingham shirt + three different ways to wear it. Which outfit was your favorite? Such great ideas! I love look #2 best but all 3 are adorable. All the looks are great! Fave is number 1 and I would have never thought to pair it with a skirt–may have to step out of my comfort zone and try it! I wasn’t sure if I would like it with the skirt, but I do! Love all these! First look is my favorite 🙂 All of these looks would be great with a chambray shirt too! A chambray shirt would be perfect! Love this post! I especially like the skirt option!